The days are steadily getting longer, and depending on the altitude the plants start growing. It’s a great time to be in the hills. It’s also a great time to give a little thought to some of the hazards associated with springtime hunting, as even river flat hunting can catch a few people out. When you leave camp in the morning are you physically and mentally ready to spend the night out if the unexpected happens? Its always good to have that in the back your mind. Prepare for the worst, hope for the best. Its not always the gear you need, but often having the right mind set. Spring time weather is really only predictable for being one thing, which is unpredictable. Be prepared for all four seasons, and especially be prepared for wind. Pay super attention to a few different forecasts and pick that sheltered campsite carefully. Always have your rain gear in your pack, it can save you a huge amount of heat loss just working as a wind breaker. I did an overnighter with just the dog in a big East Coast valley, and spent the evening looking over a number of bulls on the opposite face. The plan was to climb the first hour or so under the head torch and hopefully be in prime position before the bulls started climbing themselves. As soon as I got to the river the next morning I knew it had come up a bit but I thought I’d find a braid and get through, which I would have if I'd pushed it. But it occurred to me that the reason it had come up overnight was because it had been raining hard on the west coast and that the head waters of my valley had obviously copped the spill over. So for all I knew I’d get 5 or 6 hours of hunting on the other side then have zero chance of getting back. Not an option given the forecast. We are literally a small skinny Island in the middle of the ocean, hence our weather is very changeable and this can be especially so in springtime. Keep your eye on the forecast as always, and have a plan B in case you can’t cross that river to get home. Usually this involves sitting it out and having left some reasonably detailed intentions with someone trustworthy. After the 140mm of rain pictured above, the next day this small stream was raging and perhaps a couple of meters deep. The classic here is those big East coast catchments and the late spring snow melt. During the heat of the day the snow melt increases which can make the river and even side streams rise substantially. The hunter that easily crossed the river in the truck or on foot with his head lamp on in the morning, can easily find himself stranded and bored stupid until it drops again. Key thing here is, just don’t push the boundaries. Kiwi’s have some of the worst drowning stats out there, yes our topography plays a part but lets just be sensible. Remember that NW wind can really accelerate the snow melt, especially in those big catchments. A good rule of thumb is if it's knee deep and moving faster than walking speed, don't cross. With a group you may be able to cross bigger water than that, but it's a good general rule. Also think about what your stepping on, are they greasy West Coast boulders? If your sneaking around chasing tahr or chamois just below or above the snowline then you have to be aware of what’s above you. This season we had significant snowfall, especially around the Mt Cook region. This means that at some point in spring that snow pack with turn to slop, loose cohesion and cause a big dirty wet slide, often to well below snowline or even to valley floor. You don’t want to be there when this happens. Often you can see the smashed up tree’s and scrub from the previous year’s spring slides. These paths usually run every spring, so take note of the smashed up scrub and debris and don't loiter around in these places of stop for lunch here. 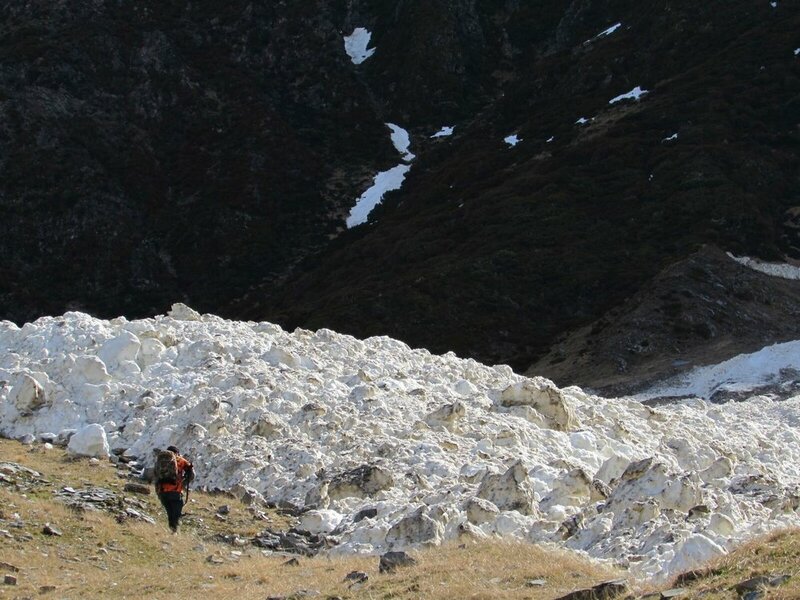 Avalanches can run well below the snowline as this photo from Trev Streat shows. I had an interesting one a few years ago up a small valley near Makarora. The spring slide had run, filling in quite a substantial side stream which in turn had hollowed out a tunnel through the debris that you could have driven a bus through. I crossed this bridge first thing in the morning as it was frozen solid, when coming back just after lunch and in the heat of the day, I realized this “bridge” was now half rotten and no way was I crossing it with the potential for it to collapse and land me on the rocks some 7-8 meters below. Check here for the relevant Avalanche Advisory Forecast. Well below snowline, this debris might be 20meters deep. Typically in spring the snow packs surface refreezes at night after having become wet "mush" during the heat of the day. Apart from the obvious sliding hazard this can be a good thing for travel in the early morning as you can move quite easily staying on top of the frozen surface IF you have the right gear. i.e.-An axe and crampons. 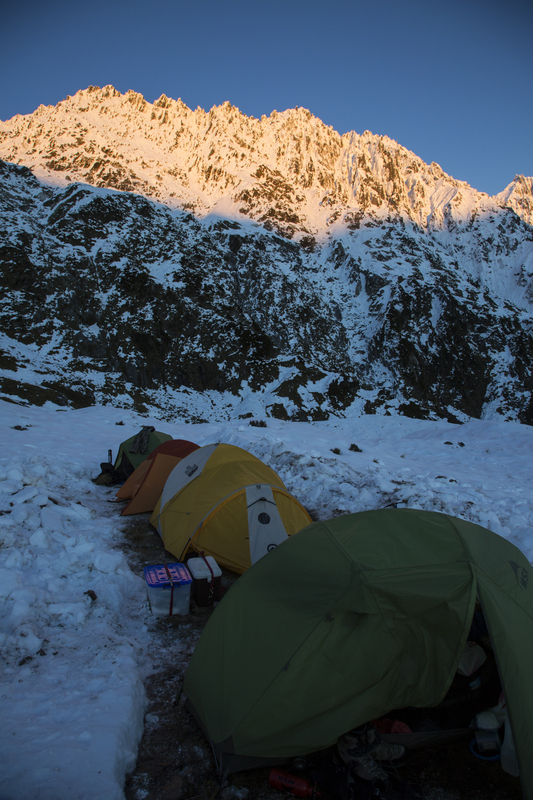 Staying on the ridges and safe high points to minimize the risk. The downside is with the heat of the day the snowpack becomes far less stable and a dangerous place to be in general. The tell tale sign of this is "rollerballs" where balls of snow start to roll down the face, often picking up more snow along the way. Roller balling is a sign of a potential loose, wet avalanche. Check avalanche.net.nz in your region as this will mention if you need to watch out for these during the day. We had a classic example of this a couple of years back when we climbed up a bunch of steep country at first light and in frozen snow. The day turned into a scorcher which completely cooked the snow pack and had roller balls running all over the place. We had no choice but spend the day on safe high points and ridges until the temperatures dropped again and we could climb down just on dark. Without understanding the significance of the cooked snow pack we could have very easily found ourselves in a bunch of trouble. Some of this applies year round. But with all this snow melt and then the overnight freeze thaw, what can happen is rocks can get cracked apart by the expanding ice. And steeper faces can become a bit of a hazard as a result. Or some faces are just loose and unstable and are always crumbling away. I learnt my lesson here quite a few years ago when I set camp at about 1600m right beside a stunning tarn in a head basin that had one really steep wall. All through the night as it froze this face was releasing rocks, which no doubt sounded bigger than they were given it was a clear crisp night, but still I was shitting myself. Looking back now I should have noticed all of the loose boulders that had rolled down by my tarn previously. Have a look around where your thinking of camping, and if the rocks around you aren’t old and covered in lichen and moss, then move on. Yip Chamois and Tahr hunting can take you into some steep country. We all have different comfort levels, so knowing your limits is key. We can’t get it right all the time, but knowing you can retrieve that animal without scaring yourself stupid is important. The below video makes this pretty apparent, he did manage to get his bull the next day. The fitter you are, the more success you will have and the less likely you are to pick up an injury. Build up a good base level of fitness and choose those multi day objectives wisely, as it’s no fun breaking yourself on a climb or battling under a heavy load. By not struggling with a lack of fitness you’ll also make better decisions on the hill, and improve your chances of success. Luke here at PointsSouth thinks nothing of climbing 1000m in elevation on an evening hunt. I’m not saying you need to go to that extent, but make an effort to get fit. Packing good quality food on the hill just makes sense as your burning a hell of a lot of calories everyday. Years ago I can remember taking off for an overnighter with just a chocolate bar and a jimmy’s pie I grabbed from the service station. Getting back to the truck starving and completely wrecked 24 hours later, I’d been walking about 16 hours total and just made the 4 hour walk out with two boned out yearlings in my pack. Pretty unsurprising I was wrecked and struggled to stay awake driving home. By using the right equipment and understanding the snowpack, we managed to take a bull from just below the skyline. Hunting in the mountains requires a heap of physical exertion followed by stopping and glassing for game. Doing this over and over means you really have to have super breathable gear and a smart layering system to deal with the weather, as well as the physical exertion. A good quality merino base layer such as the stuff from Firstlite is ideal, as even on a stinking hot summers day you’ll still be comfortable and will avoid the sandfly’s and sunburn. Add a super breathable mid layer, and you’re sorted for quite a wide temperature range. Regards of the forecast you should have in your pack an insulation layer and an outer layer to block the wind and rain. Hunting apparel has evolved and we’ve now got hunting specific insulation and rain wear that's high performing and super packable. Get the best gear you can afford, and do your homework with regards to the breathability of what your buying. Overall there’s a few basics that apply to any hunting trip. 1- Always leave your intentions with someone who will actually follow up if they haven’t heard from you when your due to be out. 4- Stay within your limits when it comes to steeper terrain. Head to the New Zealand Mountain Safety Council for more information.